While I have to admit, I’m usually a sucker for a big, fat, bone-in pork chop, these little boneless guys are so easy to cook they often capture my attention. The thinness, and absence of a dense bone, means they are fast to cook. And while they may not back the same flavor as their bone in cousins, they still taste (when cooked right) really great. Particularly, if you grill them (of course they are great baked too). 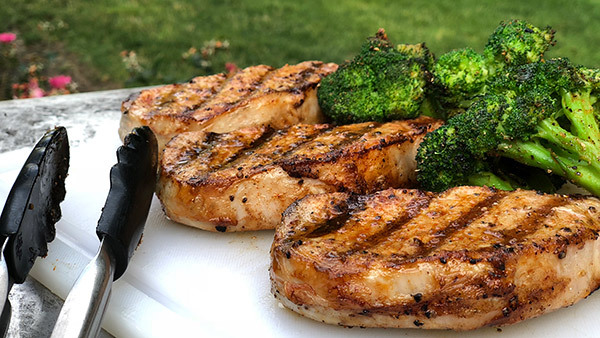 But all too often what should be a flavorful, tender, juicy chop, gets absolutely hammered on the grill and ends up more hockey puck than succulent chop. Or if undercooked, you get you get an under cooked, gray, flabby and raw chop. Either way it’s no good. Well the good news, is that grilling these chops is actually really simple. And if you learn just a few techniques – which are actually the same for almost all grilled meat – you’ll have them turn out perfect every time. With awesome looking grill marks, great flavor and tender, juicy meat. First rule, like all cooking, make sure to get some good chops. Nothing old. Nothing “slimy” or “smelly”. Ideally, they have a fat layer along one outside edge, which we’ll render out into yummy deliciousness. Don’t trim it off. Take the chops out the fridge about 40 minutes before you want to cook them, and allow them to come up to room temp. About 15 minutes before you want to cook them, light up your grill and get it nice and hot – essentially the hottest it goes. And make sure to scrape off any old gunk. You also need to lay the pork chops down on the grill, and then leave them alone! Don’t lift or move them. Not only does that ruin the grill marks, but it also lessens the caramelization you’re getting on the whole chop. And less caramelization, means less flavor. It will only take about 3 – 4 minutes on a very hot grill to cook that first side; at that time, you’ll flip the chops over to cook the second side. Now, I don’t even try to get marks on the second side as I want to make sure I don’t overcook the meat. If you get them, great; but the first side is the presentation side, and for me I don’t want to risk overcooking them. So, I cook the second side for 2 – 3 minutes. You want the pork to reach 140 degrees – use a meat thermometer to tell for sure, but the timing should be pretty good. As a final step, I like to stand the chops up on their side, with that fatty strip directly on the heat. So note…we’re talking about 5 – 8 minutes of total cooking time, over very high heat with the grill closed. It doesn’t take much more or less than that. Once you have the chops off the grill, give them a rest for 3 – 5 minutes to let the juices settle back into the meat. Then you’re ready to slice them up an serve.